With Mother’s Day coming up in a few days I wanted to share a recipe that would be perfect for your brunch table on Sunday. I found this recipe on Pinterest and like all things from that crazily-addicting website, it was all based on looks – specifically the evenly spaced blueberries and beautiful yellow color in the photo. Sweet Pea’s Kitchen did a fantastic job making this bread look amazing, so I pinned it, printed the recipe, and pulled it out of my oven not too long after. Turns out Pinterest is good for a lot more than just wasting time – this bread was delicious! 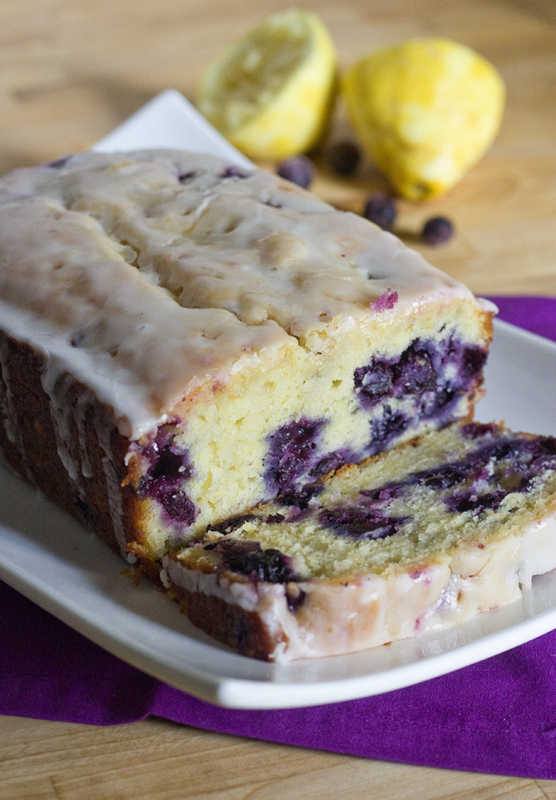 Okay, maybe it’s more “cake” than bread, but with all the lemon and blueberries, you could probably convince yourself that it’s an appropriate dish to eat before noon, especially in celebration of Mom! Sometimes I get nervous baking loaves because they can get dried out easily, but this recipe yielded an insanely moist cake with great lemon flavor thanks to the lemon syrup bath after the cake is baked. I loved the lemon flavor in this and blueberries are always a great addition to anything lemon flavored. It’s a light and bright flavor combination perfect for this time of year. Between this bread and the Sunflower Cupcakes from 2 weeks ago, can you tell I’m ready for warmer weather?? I’ve been in Boston for the week spending time at the children’s hospital dental program but unfortunately the sun hasn’t been out very much since I’ve been here. I’m still enjoying the city and pretending to be a real city-slicker commuting on public transportation and all, but I’m definitely looking forward to the sunnier weather predicted for the weekend and some time with my Mom back in CT.
Hope you enjoy the recipe and find it as pin-worthy as I did. And if you’re not already following me on Pinterest, please come on over to my boards to see what other goodies I’m eyeing! Happy Mother’s Day! Preheat the oven to 350 degrees. Grease the bottom and sides of a 9x5" loaf pan, dust with flour, and tap out excess. Slowly add the dry ingredients to the wet. In a separate bowl mix the blueberries with the 1 tbsp of flour and then gently fold them into the mixed batter. This looks delicious! Blueberry and lemon is one of my all-time favorite combinations. 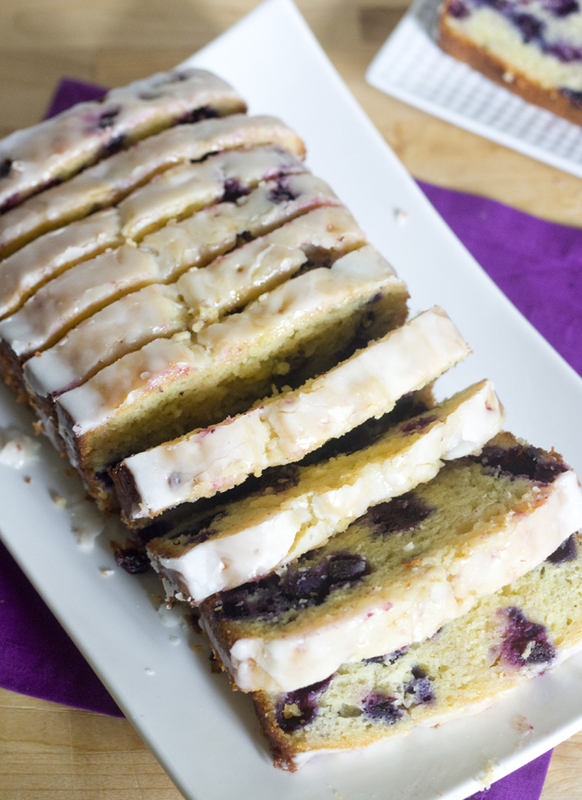 I’ve been looking for a good blueberry-lemon loaf recipe for awhile, so I will definitely be trying this one out! I always used to think blueberry and lemon was such a weird combo but after seeing your amazing drool worthy pictures I’m not desperate to give this a go, it looks so delicious! I love your matching purple serviette in the top picture! great styling! gorgeous cake and even moreso that i love the flavors in this! blueberry and lemon is definitely a great spring treat! I have probably bookmarked every lemon blueberry bread I have come across but this one looks too good to continue putting it off. oh yum! I’m loving the glaze on top too! I love lemon and blueberry together, this looks wonderful! I was just looking for a lemon blueberry recipe! Cannot wait to try it! Oh my deliciousness! I love lemons and blueberries together. This sounds amazing, especially with the glaze on top! 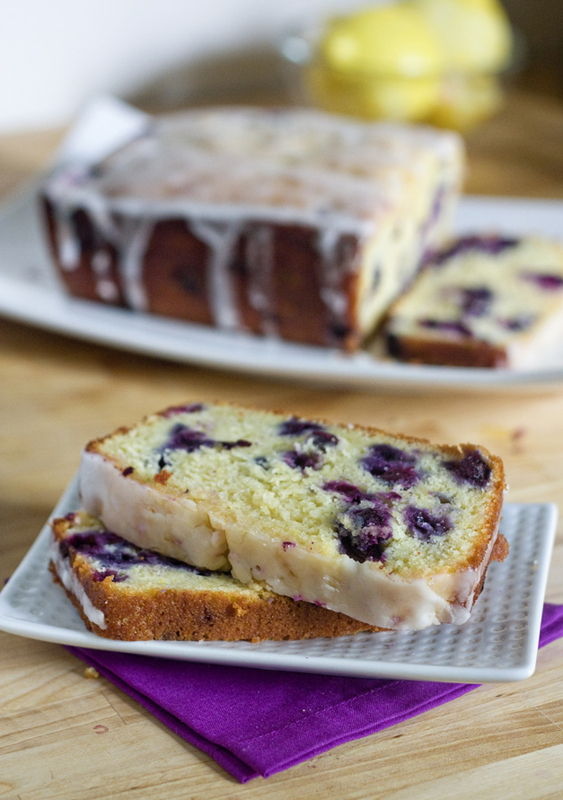 I adore lemon bread and the addition of blueberries seems perfect for spring…and a mother’s day brunch. I am making it right now. Delicious!! Thank you. One change is I leave sugar out of everything and use organic Aguava nector. Its natural, organic and taste better then sugar. It also does not affect blood sugar levels or your liver like sugar! Try it its a delicious taste in this bread. making this now, and it’s taking an extra long time to bake :( smells amazing, tho! Thank you for sharing this super yummy recipe. I made a loaf two days ago, and now I’m onto my second loaf to take to a BBQ tonight. LOVE it! My two year old can’t get enough! I made this and it is absolutely delicious. The only problem I had is that the blueberries all settled at the bottom, what can I do to suspend them throughout the loaf? Perhaps thicken up the batter with more flour? Thank you for sharing such a yummy treat! I always wait and sprinkle the blueberries ontop after I put the batter in the pans. Sometimes this causes a reverse affect and all your blueberries are towards the top, but usually they are evenly dispersed and sink a little during baking, but anyway I’d prefer them towards the top if I had a choice. It’s best to roll the blueberries in a bit of flour before mixing them so they don’t sink as much. Hope that helps! can you substitute yogurt as sour cream? Thank you for sharing this. I made is yesterday and it was out of this world. It was very moist and was not over powering with lemon. I made this recipe and the bread was very moist and good consistency but the lemon was very overpowering of the blueberries. The second time I made it I made a few modifications. First I omitted the lemon zest in the batter. Second I kept the lemon simple syrup as directed then I omitted the lemon in the glaze. The flavors really balanced out quite nicely neither one overpowering the other. Just made this and couldn’t wait for it to cool completely – already put the icing on and eating it and it is AWESOME! I used lemon yogurt and a little vanilla. YUMMAY! I made this a couple days ago and it is absolutely delicious! A definate keeper recipe. Thanks for sharing it! Made this tonight. Very tasty, although I would make a few modifications the next time around. The lemon syrup made the bread a bit too moist, so I would just use less of it next time. And, as someone commented above, I think I would omit the zest in the batter, as the lemon flavor is quite strong throughout. Maybe if I just omit the lemon syrup altogether that would take care of both issues, but then maybe it will be missing something. Also, a tip…wait until the bread is cooled completely before adding the powdered sugar glaze. Mine was still warm and the glaze melted right into the bread. has anyone had any problems with getting the bread to bake in the middle? mine has been in the oven for 55 minutes and is goopy in the middle but browning on top and on the sides…. i turned the temp down and am baking longer. any ideas on what i could have done wrong?? I had the same problem & I continued baking it until it was just set in the middle. The texture of the cake still turned out fine & it was still moist inside. Made this today, took about an hour and a half to cook! Followed the directions, waiting 10 min to take out of pan and it stuck and cracked, and the bottom was still wet! I know it tastes good, but what did i do wrong? Supposed to bring to a BBQ tonight!I used a cooking spray to grease the pan then floured it. Could this have caused it to stick? Are you sure your oven was actually at 350 degrees? I’ve realized recently that my oven’s internal thermometer is off, and I invested in an oven thermometer that made me realize my oven wasn’t as hot as I thought. I normally just use cooking spray and flour, so I’m not sure what your problem was. I’m sorry it didn’t work out! Just made this and it is delicious!!! Like a few others said I will also leave out the lemon zest as the lemon is kinda overpowering…but overall really good and moist! I just made this & it’s delicious & moist. Will definitely try again. I might omit the lemon in the glaze as suggested by other reviewers. Do you think the loaf can be frozen? Sorry, I don’t know much about freezing loaves like this, but let me know if you try it! Do you know of any modifications if I made mini loaves? What would the baking time be? Thanks in advance. I plan on making this tomorrow. I’m not sure about the baking time exactly, I know it would be less time, but I’m not sure exactly what to tell you. Just keep your eyes on it and keep checking periodically! Thank you. Making this today. I am going to make two smaller loaves and will post what time I used. I am excited to try it! Can I try this recipe without an electric whisk? I made this cake..but mine came out very dense. Do you know why this could be? Thanks! Is it possible you left it in the oven too long? Or possibly you overmixed the batter once the flour was added. It’s best to just gently fold the batter after the flour is added or sometimes the cake can be too dense. I hope this helps! So, is this in American or English cup sizes? Looks great! This recipe was absolutely out of this world. Lemon and blueberries, ya just can’t beat this combination. This was simply delicious! My husband says it tasted like it came from a bakery. My own opinion is that would use fresh blueberries next time, not frozen. The frozen berries seemed a little mushy. I just made this, smells soooooo good, my boyfriend is drooling over it! i did skip the syrup and lemon glaze and went with a regular vanilla glaze (3 cups powdered suger, .5 teaspoon vanilla, .5 teaspoon salt, .5 cup cold water), Ive made lemon cupcakes with lemon glaze before and did think the lemony-ness was a little too strong, im hoping the lack of lemon in the glaze will still make for an awesome bread!!! If I want to freeze this bread, should I wait to put on the glaze? Or freeze it with the glaze? Thanks! I think it’s best to put on the glaze when the bread is warm, it tends to absorb more that way. But I’m not sure how the glaze would freeze. I would recommend freezing it without the glaze, warming it up a bit before serving, and then putting on the glaze. I hope that works, good luck! I made this yesterday – I found the recipie on Pinterest! My husband loved it and so did I. He actually cut into it first. It’s tasty! I didn’t change your recipie at all. I’m in the process of making this right now ! I can’t wait to taste it. i just put the lemon syprup on the cake and had a question. It says to just wisk the glaze together. Does the glaze not need any heating and do I just add it on at room temperature ? Has anyone tried this without the lemon syrup? It looks fabulous as is, but I am trying to cut out some of the sugar. My toddler loves muffins and breakfast treats, but I try to limit the sugar. Maybe I will try agave nectar as someone else mentioned. Mmm! This looks delicious! 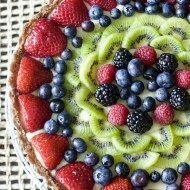 Over the weekend, I made a similar version – but without blueberries because they’re not in season right now. :( It was DELICIOUS, moist, and tangy nonetheless. Thanks for this delicious recipe! It was a hit at my house! Just on the off-chance that someone is handy right now… I’m in the middle of making it and I ran out of fresh lemon juice. I have enough for the syrup, but not the glaze. I know a number of people have suggested switching to a vanilla glaze, but my husband *loves* lemon, so I’d like to make the glaze. Can I make the glaze with lemon juice from a jar? I have some of that handy… Otherwise, I probably will go with the vanilla glaze. Hmm I can’t really say from experience, but I think that would still work! In fact, it might just be amazing :) Let me know how it turned out! I’ve made this a few times now, substituting the sugar for splenda, and it worked beautifully. I did have to use a cream cheese glaze instead of the one listed, since we had no powdered sugar, but it still tasted amazing. Definitely a favorite recipe. Olá Erica, gostaria de falar que fiz esta receita e minha familia, gostou muito, ela é fácil e gostosa, eu não tinha limão então coloquei raspas de laranja e ficou muito bom, direto do Sul do Brasil, nota máxima para esta receita. Baking this loaf right now…the batter tasted amazing, but the cake is taking a super long time to cook through, the middle is still batter after an hour and 20 mins. The edges are starting to get quite brown but the middle is gooey. Dont know what to do! I’m sorry your baking time didn’t turn out very well! Maybe next time if you run into the same problem, try tenting the cake with some tinfoil if it starts to brown so that it can bake more without burning. 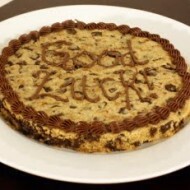 Good luck, hope it was still tasty! Loved this! Hubby requested Raspberries instead of Blueberries and it was such a fabulous sub! Skipped the syrup and added the glaze – instead of just lemon I added 2 1/2 tbs of Vanilla and 1 tbs of lemon juice, chopped up walnuts and some chocolate chips very finely and the glaze set the loaf off just perfect. For frozen blueberries, do you let them that or just leave them frozen? I made this tonight and it is very good! I agree with others about it having a little too much lemon so next time I will omit it from the glaze. I used sour cream in the place of the yogurt and White Lily self rising flour because that is all I had on hand. The bread came out perfect! Thanks for the recipe! The first time I made this, the lemon was a little overpowering. 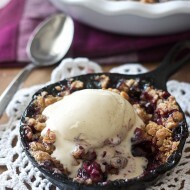 So the next time that I made it, I substituted fresh raspberries for the blueberries. It was and awesome change and I will make it this way from now on. Thanks for the recipe. Would it still come out as good if I used sour cream instead of the yogurt? Hmm I can’t say either way with confidence, but maybe! Made this last night. it was so delicious. we made three loaves… devoured one, and are freezing the other two, icing and all. Thanks for such a great recipe! I made this last weekend with blueberries from my friend’s garden. It was delicious! I don’t have plain yogurt. How about blueberry Greek yogurt? What do you think? I followed this recipe to a “T”….and it is delicious. Is it too lemony? Depends on your taste I guess..I quite like the lemon. So so moist..I didn’t have quite 1 and 1/2 cups of blueberries…so will use 2 cups next time. But this is a winner and I thank you so much for sharing this. Lovely! I made this recipe without using the lemon wash or the glaze, used Greek yogurt instead of regular, and it is delicious. I also divided the batter into two 8 inch loaf pans the second time – it cooked through in 50 minutes and I have two lovely loaves. Thanks for the recipe! I am in the process of making this loaf. It smells amazing. Just wondering if there are any good substitute for the lemon glaze, can I make the glaze without the lemon juice? I was thinking it might be a little too much lemon with the syrup and the lemon zest in the batter. Has anyone tried to make the glaze with fresh apples? Don’t know if that will be too many favors. First I was drawn to this because it looks so pretty! I’ve never made a lemon blueberry anything before but wanted something for Spring! Didn’t have lemons so used lemon juice. Also I love the syrup idea thru the cake. Amazing and beautiful! Thank u! Just made this for a Ladies Brunch. My loaf pan wasn’t deep enough so I put the extra batter in a muffin pan. TASTES AMAZING!!!!! I left out the syrup & only made the glaze. The muffins were my testers. SO DELICIOUS!!! I’m a dorm parent at a boarding school, and I made this for my girls yesterday. It was a hit! They kept asking me where I bought this — they assumed it was a bakery item. I even left off the glaze, because I figured the syrup was enough sugar for them. Thanks so much for this great, moist cake. I think the yogurt makes the difference. Nope, you can leave it wrapped in plastic wrap on the counter for a few days. Enjoy!! I made this and used parchment paper instead of greasing and flouring the pan and the bread came right out. It looks so good and can’t wait to taste it. Thanks for the recipe! I made this yesterday, and I am totally in love! As I was making it, I thought it might be too sweet, since there’s a lot of sugar in the glazes, but the fresh lemon juice really balances the tart and sweet perfectly! It’s like pound cake, so decadent! Thanks for sharing such a wonderful recipe! I made this last night. It turned out better than I ever imagined! I’ll be making this again sometime soon. Thanks for sharing! WAY to much lemon. WAY WAY WAY TO MUCH. I made this a couple weeks back and it was a hit. My husband and father n law wouldnt stop eating it. Therefore, im making it again tonight. This time im making it with mixed berrys because thats all i had in the fridge. Made this for Easter dessert yesterday, and it was a huge hit! I only had an 8″ loaf pan, so I baked it in that, and the middle would not cook after 45 minutes, so I put a foil tent on top for another 25 minutes. Perfect :) I will be making this a lot more often!!! I made this bread today and dropped it off at work for the people in my husband’s department. Everybody loved it. He brought me home a slice and I thought it was very very good, I love how moist it was. I really liked the lemon syrup and glaze too. It was definitely not too much lemon flavor for me; when a recipe has “lemon” in the title I don’t want to be disappointed by the lack of lemon flavor and I wasn’t! What a fabulous recipe, definitely a keeper! Thanks for sharing your recipe with us! Erica, thanks for the lemon blueberry bread recipe. It was a hit with my friends! There seems to be a mistake with the measurements for the powdered sugar glaze. The recipe currently (6/2015) shows one cup of powdered sugar and 3-4 tablespoons of lemon juice. The frosting would not harden for me with those measurements. When I re-made the frosting using one cup of powdered sugar and 3-4 TEASPOONS of lemon juice, the frosting set up the way it should. Thanks again for this awesome recipe! Wish I had read the reviews first, bit I was so impressed with how good this looked in the pictures, that I went ahead and wasted my expensive lemons and blueberries. Much too sour. Much. I sprinkled granulated sugar over the glaze, but that didn’t help. I will not make this again, but for those of you who are all about sour, you may still want to add another cup of sugar to the batter. Can this be made in something other than a bread pan? Made explicit to instructions, which by the way, were NOT explicit enough for a novice, which I am when it comes to something like this. Other sites advised to use ONE Tbsp lemon juice at a time when making glaze so as to maintain thickness; so much for mine. And I really don’t see the need for the lemon syrup to pour over a moist bread anyway. Needless to say, mine was a complete DISASTER! Barely edible and after eating a slice less than an inch wide, I felt like I had swallowed a bowling ball! Moral: If you are going to ADVERTISE a recipe, PLEASE give EXPLICIT instructions so a complete novice would be able to follow! after reading the comments, I made some modifications, I used 1/2 cup lemon flavored greek yogurt, and 1/2 cup light sour cream in place of the cup of vanilla yogurt. . I too had to bake an additional 10 minutes as the center was not done. Eliminated both the syrup and the glaze as I am trying for a healthier version, with less sugar and it turned out great! I loved this cake but it’s wasn’t as good as yours in the looking and was a little bit dry in tasting. I use gr, ml, etc so I had to convert every ingredient’s proportion and I have to admit that it’s not that simple and maybe that’s why the cake wasn’t as good as expected. If you have the same recipe with French proportions, I will love to try it! #1- This is delicious. My husband has made it twice and I’m making it a third time today. #2- I love how you write your recipes with the ingredients in order. Why can’t everyone do that? lol! Pingback: Favorite Recipes | Everything "M"